Sometimes finding a Christmas line that has everything is hard to find. However, Little Yellow Bicycle was able to put practically everything in this line. They have an amazing amount of embellishments to go with this line. 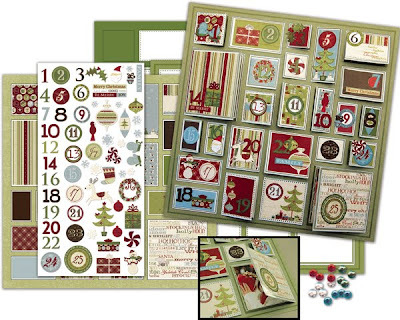 Stickers, chipboard, jewels, border strips, die cuts, journaling tags and more! There are a few kits as well. Card kit, album kit, countdown kit and a gift box kit! Let me show you!! -Great patterns, both tight and large. -An incredible amount of embellishments to choose from! -My one and only complaint is that in the album they have, there is only one clear acrylic cover sheet. I would have liked to have one for the front and one for the back. What I liked about this Pillow Box was that everything was pre-made and pre-scored. It was fabulous! Supplies: Little Yellow Bicycle Album and stickers and papers to fit. 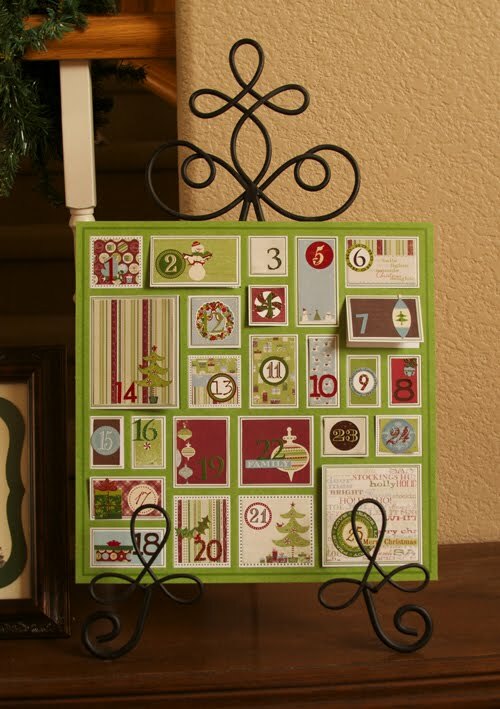 This countdown calendar came with everything including jewels and other embellishments! Bottom Line: I really felt that this line had it all. Patterned Paper to make layouts and cards. A card kit if you aren't a card maker on your own. All the essentials for gift giving: boxes, tags, holders. It was just a fantastic array of yummy goodness that was all so useful! What do you think? Was this line a delight for you or not so much? Let us know! 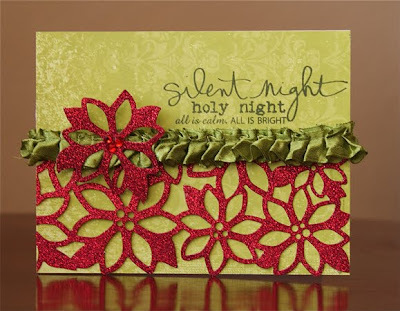 This Christmas Delight line looks awesome, thanks for all the inspiring ideas!! Ouuu! 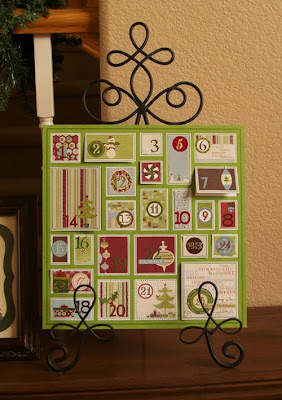 Anything that includes an advent (countdown calendar) is AWESOME! I like that this line's colors and shapes would fit well with vintage or modern concepts. Am I deprived or what? I have never heard of Little Yellow Bicycle. I love the Christmas line. Now I have to go make my "After Christmas Wish List". 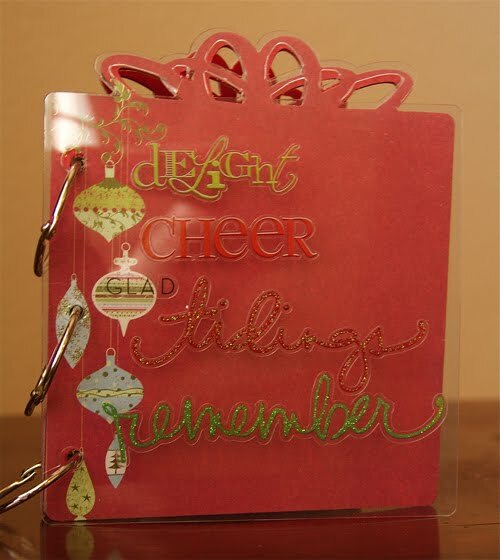 The vintage coloring is FABULOUS...sometimes I like bright, but I LOVE these papers and elements! I am definitely going to try and find these locally. Thanks for a fantastic review! p.s. EVERY one of your creations is SUPERB! Beautiful card! Loved the projects...I'll have to take a look at this product line. Thank you! 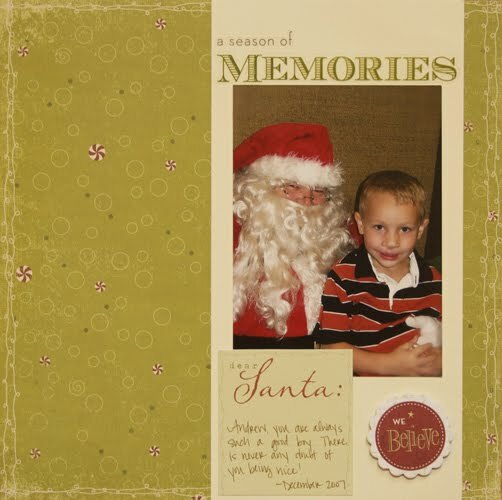 Oh, I love this Christmas line from LYB. 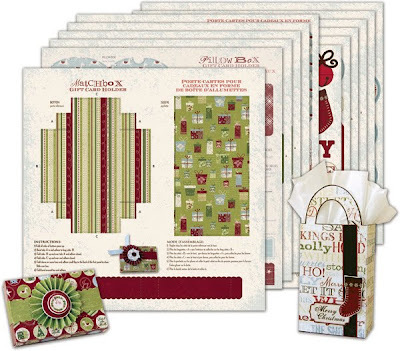 It is great that there are so many kits and embellishments available. I like the line. it looks great. But I must say, I almost never use the embellishment which come with a line. 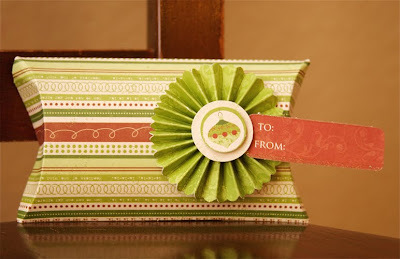 When using the papers I always like to make my own embellies, with my QK, or stamps etc. Ashley, your projects are beautiful! I especially like your card. The first LYB sheet posted looks fun, are those rub ons? Stickers? I always look to LYB to include all the fun embellishments in their collections. Great projects, I'd happily lift any/all of them! This line looks interesting. Love the rub ons and I love that red glittery die cut paper.